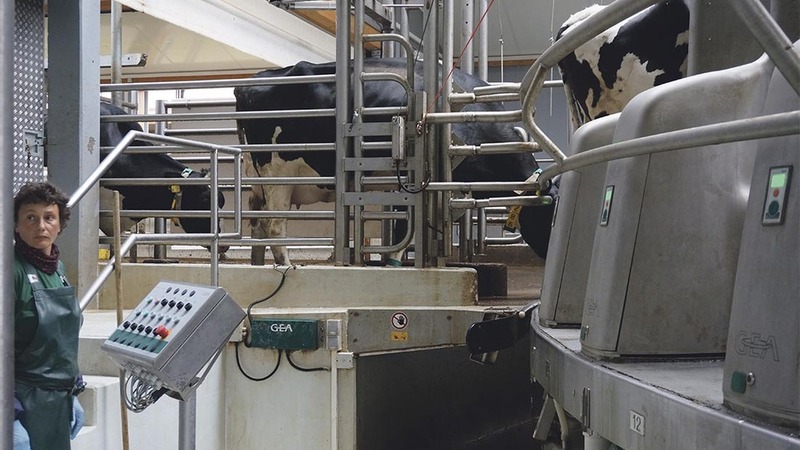 With an individual robot arm at every stall, GEA Technology launched the world’s first fully automatic external rotary parlour in Germany last week. Called the DairyProQ and with four prototypes currently running in Germany and two in Canada, the system was described was a ‘game changer’ in dairy automation by GEA’s vice-president of large project sales, Steve Pretz. He said: “Farmers have an increasing number of things to look after on-farm and automation will help them cope with these challenges. Press from around the world gathered in Teichroda, south east Germany to see the 40-point system, which was installed on farm in June last year. Milking 200 cows per hour and needing one member of staff to milk, the herd of 400 Holsteins could be milked in just two hours. The system was installed by father and son Eckehard and Stefan Blottner, who farm 1,740 hectares (4,300 acres) with pigs, beef, geese, ducks and deer as well as the milking herd in their co-operative farming enterprise Teichel e.G. Agricultural Cooperative. On explaining why he made the investment, son Stefan Blottner, sited lesser dependence on a labour, consistency in the milking procedure and improved efficiency as the key drivers. Dr Blottner said they wanted to move from milking two to three times per day but did not want to spend money paying good staff to milk all day long. At three daily milkings, the parlour runs for six hours per day and requires one person to watch the robots and assist with any cows which need to be manually attached and another bringing cows in to the collecting yard – the aim is to have one person doing both. Consistency of milking was also a big appeal for the father and son duo. “For a cow, the best thing we can provide is a consistent milking procedure and the DairyProQ can milk cows more consistently and accurately than any workforce,” said Dr Blottner. Cows are brought into the collecting yard and enter the rotary as normal. Each robotic arm sits in a stainless steel box within each stall divider. Teats are cleaned, dried, fore-milk stripped and post-dipped in the liner. Pre-dipping can also be applied. “Efficacy of milking is not dependant on staff. Every cow is stimulated properly for a fast milk let down and teats are accurately dipped and performance is never variable. Since the herd has moved to three-times-a-day milking, yields have increased from an average of 28kg per cow per day to 33kg, with the highest yielding group hitting 42kg. 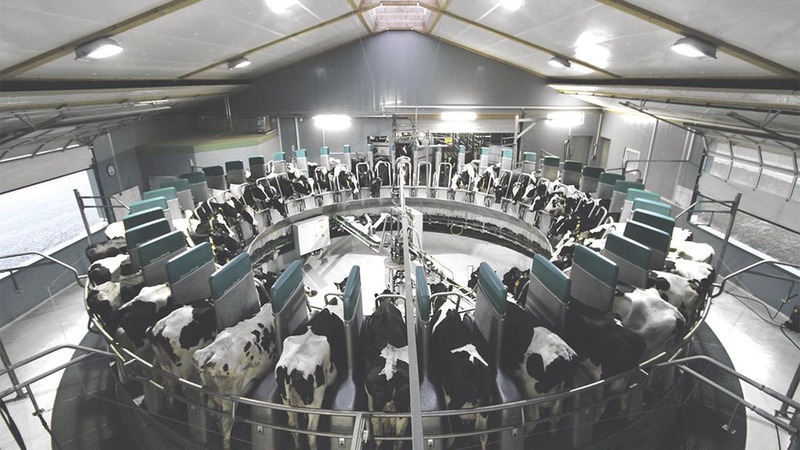 Somatic cell count has also seen a positive reduction, from 260,000-90,000, which could also be due to cows being housed in a new building with a better environment. The system also claims to have a unique service system. If a robot breaks down the stall can be blocked off, leaving the remaining 39 robots to continue milking. The stainless steel unit is taken off and left in a small service room contained within the parlour building ready to be fixed in normal working hours. When probed on cost, GEA representatives said ‘each robotic point costs significantly less than a single robot box’. The rotary ranges from 28-80 stalls, with capacity to milk between 120 and 400 cows per hour. The system is available in the UK, with current interest and predictions of the first installation in the next two years. 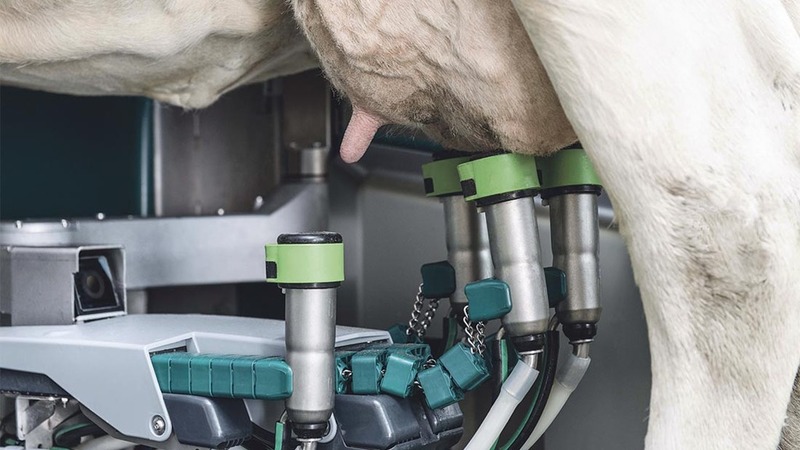 Also being launched was GEA’s mono-box milking robot. Geared towards farmers with up to 70 cows maximum, the robot uses the same technology as the DairyProQ rotary. It will be available to UK farmers in 2016.